Yesterday's (Tuesday, September 1, 2009) Expecting Rain news page had a couple of interesting links provided by über-correspondent, Scott Miller, pertaining to the novelty hit single of 19 and 47, "Open the Door, Richard." One of the links was to a detailed Wikipedia article on the history of the song, which I commend to your attention. The nature of Wikipedia is such that it's often hit and miss when it comes to either accuracy or quality. But you'll occasionally find well-written articles that carefully cite their sources, as does this one. I question some of the anonymous author's conclusions, but that's what makes horse races. Although the article says "Open the Door, Richard" started out life as a vaudeville routine, it's more likely that it was first a song on the blackface circuit, written by the great Bob Russell, who was working in a troupe called "The Florida Blossoms" during the mid-1900s. According to Pigmeat Markham, he of "Here Come De Judge" fame and one of several performers who would popularize the "Open the Door, Richard" routine, Russell wrote the song for a skit called, "Oh, You Mr. Rareback," and it was performed and possibly expanded by "Spider Bruce" (John) Mason. According to the book This is Pop, Mason claimed to have been doing the song as early as 1919, and definitely was performing it in a Broadway show called Bamboola in the late `20s. One of Mason's co-actors in the show was a young comedian named Dusty Fletcher, who would later make his version of "Open the Door, Richard" a hit at the Apollo. The history Showtime at the Apollo describes Fletcher appearing on stage, "... dressed in rags, drunkenly weaving, and with a ladder as his only prop." With ladder planted center stage, Fletcher would bang on an imaginary door (sound effects provided by the orchestra pit), while imploring roommate Richard to open up in drunken semi-song. "I know he's inside," Fletcher would mutter. "I'm wearing our only suit." With Richard uncooperative, unresponsive, and likely in the embrace of love's sweet arms, Fletcher would next use the ladder to try to get in, only to crash to the floor. Repeat for as long as the jokes would hold out. Some sources say saxophonist Jack McVea saw Pigmeat Markham, who had inherited the routine from the retired Fletcher, perform "Open the Door, Richard." Other sources say he learned it directly from Dusty Fletcher himself. In either case, McVea decided that "Open the Door, Richard" would make a great novelty tune, similar to the stuff that Louis Jordan and his Tympany Five were getting action with, and came up with what he called "that simple melody," performing it along the R&B circuit, and gradually building up the story until it was a full-fledged musical fable. In late 19 and 46, Jack McVea and His All-Stars went into the studio, recorded "Richard," and it was released on the Black & White label in January 1947. It was an immediate jukebox hit, sales outstripping supply so quickly that Black & White was out-of-stock of the single by February, when its "Richard" hit #3 on the Billboard charts. 10,000 copies of the single were shipped to New York City alone to meet demand. As usual, a hit attracted the other big "M" often associated with music, "Money." Dusty Fletcher and John Mason surfaced, both claiming authorship of "Open the Door, Richard." In fact, Dusty Fletcher, being no fool, came out of retirement and into the studio and recorded his cover of "Open the Door, Richard" just days after McVea's release. Interestingly, Fletcher would also claim that one of his original versions of the song had been called, "Open the Door, Homer," a title later used for a much different version by a certain musician living semi-retirement in Woodstock during the late `60s. Eventually it was decided there was enough moola from "Richard" to go around for (almost) everyone, and the song would be credited in later releases as, "Words by Dusty Fletcher and John Mason" and "music by Dusty Fletcher and Don Howell." Notably missing from the credits was Jack McVea. Nobody knows who the hell "Don Howell" was, although McVea's contention that the name was a pseudonymous front chiefly designed to screw him out of his rightful royalties is probably accurate. There were dozens of covers of "Open the Door, Richard," including one by the Count Basie Orchestra, which hit the #1 slot just a month after the original's release. About every take on the song you can imagine was cut - bop versions, doo-wop versions, hillbilly versions, calypso versions, versions in French, Spanish, Swedish, Hungarian, Yiddish versions, white-guy versions by Jimmy Durante, Bing Crosby, Jack Benny, and Burl Ives among others, and the slightly blue version by Walter Brown with the Tiny Grimes Sextet that we included above. "Open the Door, Richard" would become a catch-phrase in both black and white communities for a decade, and may have sparked the first full-bore marketing craze of the post-war era, with everything from perfume to beer carrying the slogan. The song would lose its luster in the black community in the `60s, some feeling it was Uncle Tomish and on a par with "Zip-A-Dee Doo-Dah." But its legacy lives on, bringing a smile to the faces of those of a certain age... just as long as they aren't named "Richard." 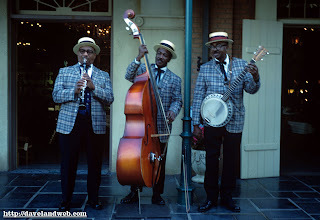 The original Royal Street Bachelors circa 1968. From left: Jack McVea on clarinet, Herb Gordy on bass and Harold Grant on guitar. Jack McVea only earned a few thousand dollars from his hit, calling it "just another song" from a money perspective. In his later career, he led a strolling group of Dixeland musicians at Disneyland for 27 years, from the `60s into the 1980s. My father was a gigantic Dixeland fan, always pausing our family on Disneyland's Main Street or in New Orleans Square when the band came by. It's likely I saw and listened to Jack McVea, not knowing who he was, while I impatiently waited to get to Adventureland. McVea died in 2000. Eight years later, his "Open the Door, Richard" would be played during the "Lock and Key" episode of Theme Time Radio Hour, almost 60 years to the day after the song was first released. Our Host prefaced McVea's "Richard" with an excerpt from Dusty Fletcher's version, mistakenly crediting that one as the original. Or maybe it was. Only Richard could tell us, and he ain't answering. And for even more on the story, see "And Even More Richards"